As of September, 2017, Australians cannot legally play online blackjack or other casino games. This page is intended for an international audience. If you are based in Australia, use this page as an informational source only. Real money blackjack continues to thrive in the online realm of gambling, boasting the most variants of any casino games, aside from the pokies. For the appealing nature of a luck balanced with a skilled card game, regulated and licensed Internet casinos are your best bet – they are accessible and convenient, allow you to conduct secure real money transactions, offer numerous quality and unbiased blackjack variations, provide accurate and prompt payouts of your winnings, and their gaming titles own superior odds and lower house edges than the games at your local land-based casino venue. Players can also trial the catalogue of blackjack and other games within practice mode, before depositing and playing with real money. When you are ready to start gaming with actual cash, simply access the banking section of the casino lobby, and you can select from a host of secure, globally trusted deposit options to fund your account. Ensure you make the most of the marketed welcome cash bonuses when you are crediting your account for the first time. All sites boast a fully-fledged mobile gaming platform for the latest smartphones and tablets. The quality of the graphics and sounds are not watered down at all, and the catalogue of available games present to the player an ideal chance to win some quick cash on the go. Make sure you register with an active email address so you can stay up to date with the constant stream of promotions, bonuses, competitions and tournaments on offer to players. As Web browser technology continues to improve at a rapid rate, the ‘instant play’ modes of online casino sites are becoming more popular and of higher quality. Each of our listed sites boasts its own ‘instant play’ browser based gaming platform, utilising formatting language such as HTML5 and Flash to power rich and high definition graphics, visuals and sounds. While the option to download the complete gaming software package directly on to your computer is available at some of our recommended sites, instant play mode is quickly matching all of what the original software has to offer. Additionally, you can access your account on any platform playing directly via your Web browser. Each of the above games are operated by tested and approved random number generator (RNG) software, so all card dealings are truly randomised and unbiased. If you are looking for something that is even more authentic, you can try live dealer blackjack, available to play at each of our listed blackjack sites. Live dealer blackjack has revolutionised how keen punters play and enjoy this favourite card game. Each casino operator employs a certain live dealer gaming host (such as Microgaming, Evolution Gaming, Ezugi and others), which runs its very own gambling studio, set up in one of the many registered and regulated gambling jurisdictions across the world. For example, Microgaming, which operates its live dealer gaming studio from Canada, employs hundreds of professionally trained croupiers to run games such as blackjack, roulette, baccarat, poker and other popular casino titles. Utilising authentic casino equipment, the games and croupiers are filmed with high definition cameras and streamed in real time to the casino operators hosting website. 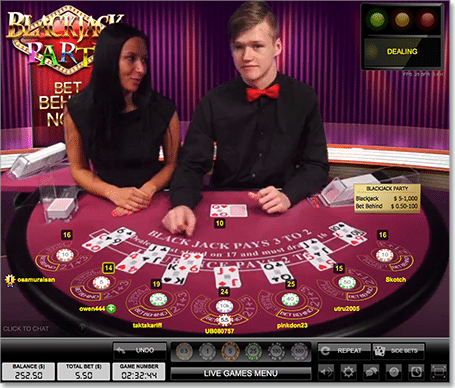 Registered members can then access these live titles via the live gaming lobby, and partake in real money gambling via any compatible device (tablet, computer, mobile, Smart TV), while chatting to other players and the friendly and highly attractive croupiers – an engaging, interactive and enhanced gaming environment for those who are keen to experience the real thing, without trekking to their local casino. All real money transactions are protected by the latest digital encryption technology, and no personal information is ever shared with third party companies. Members will be required to verify their identification when requesting their first withdrawal, and can use a copy of their driver’s license, a copy of a utility bill with their correct address and name visible, or their credit card (with the middle numbers hidden) to do so. It is no longer legal for all Australian aged 18 years and above to access and utilise the services provided by our online and mobile blackjack casino sites. The Australian government made it illegal to access sites licensed and regulated by appropriate gaming governing bodies, such as the U.K. Gambling Commission, the Malta Gaming Authority and Curacao eGaming – three of the most trusted and respected regulatory companies within the industry. The Australian gambling reforms made it illegal to access sites which are also audited by independent testing agencies, such as the eCommerce Online Gaming Regulation and Assurance body (eCOGRA). These ensure that the software used and games marketed are fair an unbiased, that all players are protected, and that responsible operator conduct is displayed. To find out more information about the individual registered blackjack gambling websites, you can access their ‘contact us’ page/section.